Distance runner Patrick Sweeney will be the first to tell you he enjoys a sip of good bourbon. But for most of last weekend, the Manhattan Beach native had Guinness on his mind. 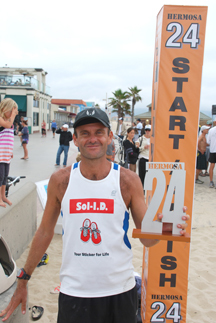 With almost a half hour to spare, the 32-year-old Mira Costa alumnus accomplished his goal of becoming the Guinness World Records© holder for Greatest Distance Run On Sand in 24 Hours. His 87.36 miles broke the record of 83.04 miles set last Labor Day weekend by his friend Christian Burke, who had shattered the previous record of 62.14 miles while using the attempt as a fundraiser for Hermosa Beach schools. The ultramarathon was so successful that Burke decided to make it an annual event. As race director, Burke had his hands full and did not compete last weekend but plans to go head-to-head with Sweeney next year in what should prove to be an exciting competition. Although he is sponsored by Stone Brewing Company in Escondido, it’s ironic that Sweeney still has the image of a satyr drinking a pint of Guinness that was tattooed on his leg many years ago. His website is bourbonfeet.com. After a few photos were taken of Sweeney holding the perpetual trophy consisting of a large silver “24” that will have the name of each year’s winner added to it, the new record holder asked someone to take the award away. “I’m so tired I can barely hold it.” Sweeney said as some rushed to bring him a folding chair to collapse in. When the race began Saturday at noon, the sun was bright and the sand was hot. Many runners suffered from blisters on their feet and toes. Sweeney said the wind picked up in the after which made the race a little bit more difficult, but then a beautiful night and morning helped him through the endurance test. Sweeney said his next challenge will come on the Fourth of July when he competes in the annual Ironman competition in Hermosa Beach where participants must run a mile, paddle a surfboard a mile in the ocean and then consume a 6-pack of beer. The first person to hold their beverage is deemed the winner. “I’m pretty good at the running and drinking part but the paddling is the hardest leg for me,” Sweeney said. Providing support for the duration of last weekend’s 24-hour event were Sweeney’s mother and sister. Diane Sweeney, who taught in the Manhattan Beach School District for 40 years, was proud of her son’s accomplishment. Sweeney’s sister Kirsten Pollicino, of Redondo Beach, is herself a runner and kept track of Patrick’s pace. A video of the beginning and finish of each lap was provided to Guinness officials for verification of the record. A lap is disqualified if a runner leaves the sand without checking out at the scorer’s table. Alex Mendoza, 15, of Rolling Hills Estates finished second running 60.48 miles. Sweeney told the teenager how impressed he was of the youngster’s accomplishment while the two put their feet side-by-side comparing blisters on their big toes. Marla Hernandez, of Del Mar, completed 13 laps to take top honors in the women’s division. Hernandez held off Julie McMahon, of Manhattan Beach, who finished within nine minutes of the winner. Through the solo and relay categories, The Hermosa 24 created opportunities to those individuals or teams to raise funds for any school or cause that a team wishes to represent. A pledge drive system was been created to allow relay groups to gather donations for miles or laps completed, or a one-time donation that upon completion of the event will be directed at their school or cause. All entry fees go to schools in Hermosa Beach. Michael Monaghan, of Redondo Beach, was awarded $100 for running the fastest lap (pier-to-pier) and Terrance Honane, of Torrance, earned $75 for having the fastest time for one mile. Burke was unsure of the exact amount raised for the school system but said it would be in the thousands. His daughter, Halle is a 6th grade student at Hermosa Valley School. “Christian put on such a great event and to be held on Father’s Day and give back to the schools and his daughter makes it very special for me,” Sweeney said. “At this point in time, anything anybody’s willing to do to benefit the schools is huge on its own,” Hermosa Beach Councilman Michael DiVirgilio said. “I think what’s been really special about Christian’s effort is that he’s brought his best talent to bear and on his own, with his core of supporters, has built this really terrific program that attracts an optimistic outlook about schools, that there is more than can be done, it’s easy to do things and it’s not always a bake sale and it’s not always bad news. Burke is optimistic that the event will continue to grow for many years to come.